CPA won’t be releasing a fixtures plan just yet as talks continue with key GAA officials. THE CLUB PLAYERS Association has marked its 100th day in existence by admitting it “underestimated the scale” of the fixtures problem within the GAA. The player body launched in January and outlined the importance of ”turning things around” with a concrete fixtures plan within 100 days. 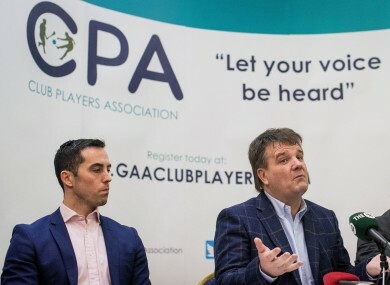 CPA says it won’t be releasing a fixtures plan just yet, as talks continue this week with key GAA officials and the Gaelic Players Association. The statement continued: “While there has been a lot of opinion and discussion, there has been little movement on club fixtures. Congress made their decision on the Super 8, which we all now accept and have to live with. “There has been no attendant fixtures master plan on the club game in 32 counties. On that issue as GAA members, we are no further along or any the wiser in terms of an official plan. “The problems remain and are being addressed in the usual sticking plaster fashion in individual counties whose volunteers are often ill equipped to deal with the problems they face. “In launching the CPA we perhaps underestimated the scale of the problem, and overestimated the ability of the GAA to get to grips with the real issues. But 100 days have not been wasted. “We have not been officially recognised, yet our work continues. It is not about official recognition, we are all members of the same association trying to make it better. “The recent situation around club fixtures in a number of leading counties where the rulebook appears to have been set aside with the attendant fixtures chaos underlines a blatant disregard for the rule book in an Association that applies the rule assiduously in matters of Congress, playing rules and player suspension. “The GAA offers competitions that many county teams have little hope of winning. If it is about winning, an individual club player’s best chance of winning in the GAA is with their club. Email “100 days since launch, CPA admits it 'underestimated the scale of the problem' in the GAA”. Feedback on “100 days since launch, CPA admits it 'underestimated the scale of the problem' in the GAA”.